I am right in the middle of a move and had forgotten how demanding moving can be!! I'm relocating from London to Nottingham and the past two months have involved a lot of to-ing and fro-ing! The whole thing has me running around and as a result I am totally run down! 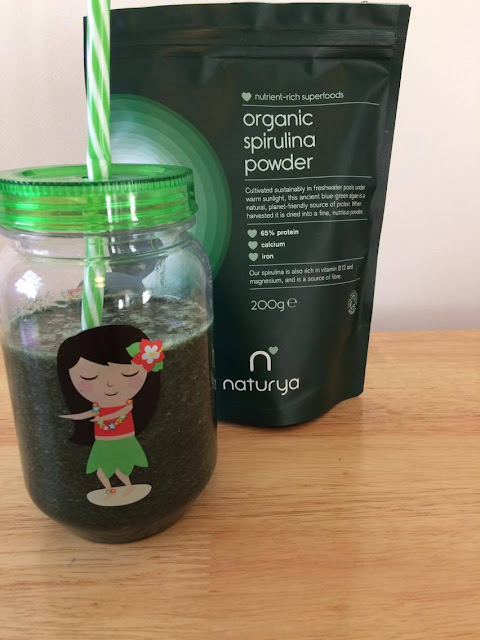 This morning I woke up feeling I needed a major boost and thought to look in my *Holland & Barrett bags (*see blog dated 23rd Jan ) for inspiration, and I found it in Naturya's Organic Spirulina Powder! I'd been saving the pack for future posts but today couldn't have been a better time to try it. I needed a major boost just to get me moving and to help me fight all the negatives my body seems to be trying to fight off. I remember the first time I had a drink that contained spirulina. It was about a decade ago in Naked drinks at my local Starbucks. I absolutely loved the taste and remember feeling very virtuous and buying extras to take home with me as I couldn't find them in any other shops even though I'd see them on American tv shows! Then about 3 years ago, I noticed them being added to drinks at different fast-foods, health shops and takeaways - such as The Light Centre and Vital in Moorgate. 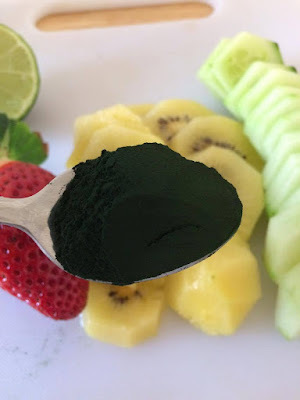 Again, I was able to enjoy the benefits of drinking smoothies & juices that contained spirulina. I had never used spirulina myself so today was a totally new experience for me. First I googled to see what kind of smoothies and juices people made and noticed very mixed views. Some people would say it tasted pretty fishy so go easy with it until you get used to the taste, others would say definitely add sweetener, yet others would say just mix it in water and drink! I decided to just go and get a few bits of fruit and veg and mix a small amount of spirulina in and take it from there! I ended up making quite a green juice but after tasting it, realize I can mix it with anything! So, this is how it went! Firstly, let's talk about the packaging. I was a bit concerned about opening the pack and then having to tape it up for my move - but I need not have worried. The strip at the top opened so easily and closing the pack after was so effortless! 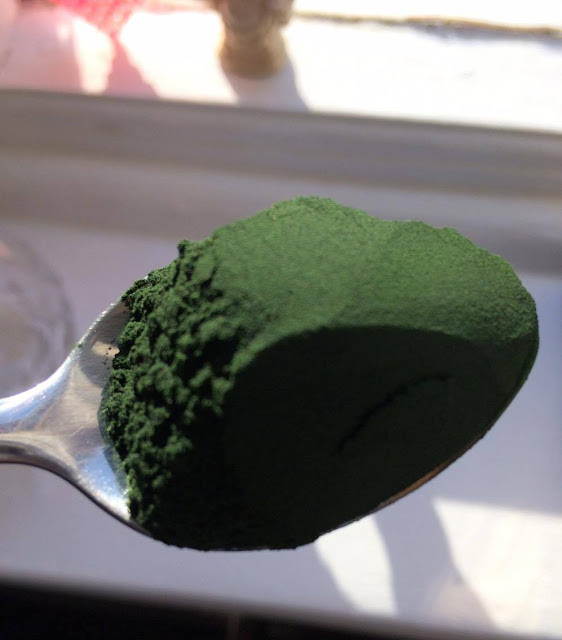 1 heaped teaspoon of spirulina, though next time I will make that one tablespoon! Put in blender or whatever appliance you use. So many use NutriBullet but I don't have one so I use my old faithful, Morphy Richards blender and whizz it all up in about 6 seconds! It tasted delicious!! I'm so glad I waited to see if it needed honey, cause it didn't. Perhaps it was sweet enough due to the kiwi and strawberry.. Also, once I realized the taste was not overbearing, I dipped my finger in some spirulina and tasted it on it's own and it was fine, though I know if I had done that a few times more I would have not been able to tolerate it. Extremely high in Calcium - apparently 26x more than milk! 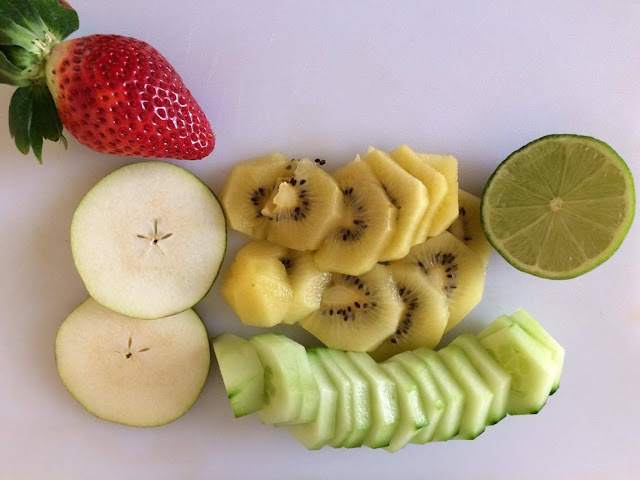 Source of potassium, chromium, copper, selenium, magnesium, manganese, zinc, phosphorous, vitamin C, D and E! Also, contains B vitamins such as thiamine, riboflavin and folic acid. These will help the heart, the mind, lethargy, skin and so much more! A big antioxidant, anti-inflammatory and may also help with allergies and sinus issues. *One last important note, I am the kind of person that looks at every food as a whole - As someone who has studied nutrition, I look at all the benefits but also look at what may cause a problem for certain people. For example, I remember drinking cactus juice every day for a couple of weeks, until I nearly fainted on the way home and looked up more information about it and realized it lowers blood pressure which is great for a lot of people but not me, who has quite low blood pressure in the first place! Same goes for grapefruit- it's a nutritious and helpful fruit, but mix it with some medication such as drugs that treat cancer or high blood-pressure, to name a few, and it can be deadly! So, if you are worried as you are on certain medications and have certain medical issues do consult a professional before you start taking spirulina. 'The fierce spirulina thrives in a hostile environment deadly to most microorganisms. So it can be organically farmed without need for chemical pesticides to sterilise it. Ours is grown on a island in the South China Sea – surrounded by rich forest, protected from urban or agricultural pollution. We rigorously test for mercury, lead and other contaminants, guaranteeing a pure product without risk of heavy metal poisoning. We also test the growing ponds daily for pH value and optical density. I will certainly continue adding it to my foods and drinks and look forward to seeing some positive results. After all, it did give me the energy to do what I needed to today! So informative, thank you! As I mentioned, when I had it, I didn't like it. I think I had something from Pod which contained it but I'll consider trying it again as the nutrients are impressive!